How far does the hate go at MSNBC, the official network of insane liberal hate? Try this. 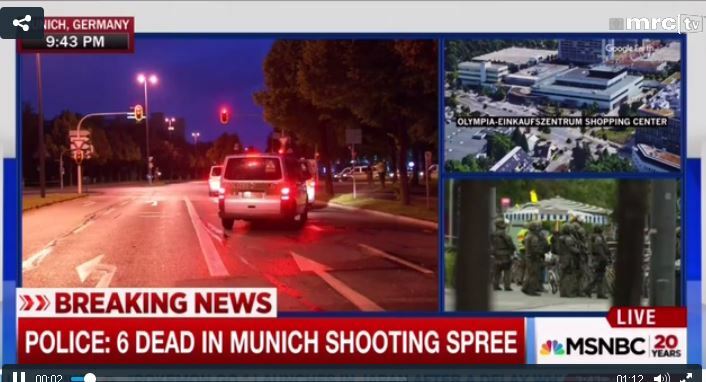 On Friday, Daily Beast editor Christopher Dickey tried to connect the horrific Munich terror attack to the Republican convention, Newsbusters’ Scott Whitlock reported. “What we’re looking at now in Europe and, to some extent, at the Republican convention and in the discourse in the United States, is a lot of talk about war as if we’re talking about a massive operation,” he said. Dickey is the same man who decried the “rampant Islamophobia” and “xenophobic politics” of Europe. He also feared the European right “will continue to be on the rise” in the wake of terror. What’s next? Will they blame the Tea Party or the NRA? Or will Obama come out and tell us not to make judgments despite reports the gunman was an 18-year-old German-Iranian Muslim said to have created a fake ad on Facebook to lure children to a McDonald’s so he could kill them? “Witnesses said that the gunman screamed ‘I’m German’ and ‘Allahu Akbar’ before shooting at children,” the UK Daily Mail reported. Yeah, that sounds just like the RNC, right, MSNBC?